Wall-mount your server or networking equipment sideways, for easy access. The RK819SIDEM Side-mounted Wallmount Open Frame Rack/Cabinet is an 8U server rack that lets you mount your (19-inch wide) servers, A/V or network equipment facing perpendicular to the wall, for easy access to mounted devices and equipment. The cabinet/rack features open access to both the front and back of your devices, making it easy to adjust cabling, view LEDs and access configuration buttons as needed. Plus, the nature of the sidemount configuration allows for deeper mounting depths than typical wallmount racks, without causing an obstruction.Constructed of high-quality SPCC cold-rolled steel, for strength and durability, the open frame equipment rack allows for maximum airflow while still supporting a maximum weight capacity of 159 kg (350 lbs). 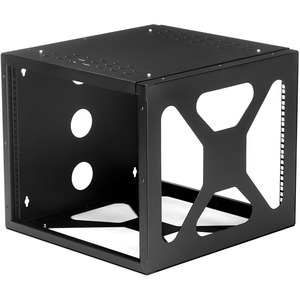 The wall mount rack also ships complete with all of the M5 screws and cage nuts required to mount your equipment, saving the expense of purchasing them separately.Backed by a StarTech.com Lifetime warranty.